Dimension (L*H*W): 36cm*32cm*12cm/14.2inch*12.6inch*4.7inch; Inner laptop compartment size: Max. length is about 34cm/13.4inch, Max. Width is about 26cm/10.2inch. External: 1 zippper pocket in the flap, 2 side pockets, 1 back zipper pocket. Internal: 1 zipper pocket under the flap which has 3 pen slots, card slots; 1 large main zipper pocket which has 1 inner zipper pocket; 1 inner cushion padded laptop compartment. Since the size is manual measured, the real item could be slightly different from the size above. 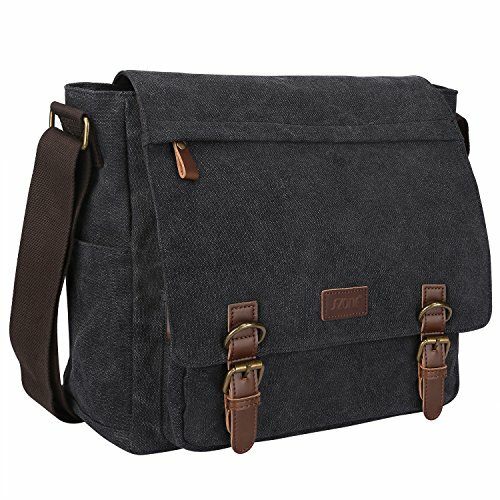 Due to lighting effects, monitor's brightness/contrast settings, etc., there could be some differences in the color tone of the pictures and the real bag.